The Foldergallery is a revised module of the V1.34 beta version of Jürg Rast of 26.09.2011 for Websitebaker CMS. It is a picture gallery to handle many pictures in different categories. 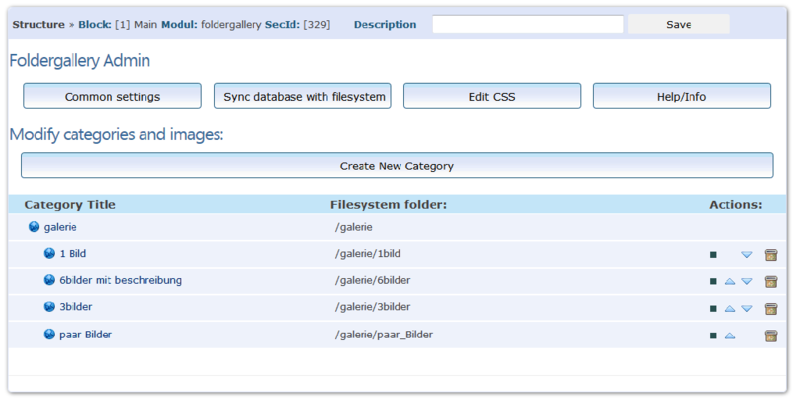 Categories are based on the folder structure on the server so they are created automatically when you synchronize the file system with the database in the foldergallery backend. In the backend, an upload function and many basic settings have been added. The doubling of the categories is switched off. + Falls es mehrere Seiten für eine Kategorie gibt werden in der Lightbox jetzt alle Bilder angezeigt. + Anpassung der Thumberstellung um ein Ordentliches Erscheinungsbild im Frontent zu bieten. + Kreuz und quer durch alle Scripts. + in der view.php rontend.css überprüfung hinzugefügt. + im backend funktion "alle Ordner neu scannen" entfernt.